This is our fifth and final episode on the Brusilov Offensive of summer 1916. We have already covered the build up, the opening attacks, and then the second round of attack, today we will look at the final set of efforts made by the Russians. As the Eastern Front moved into July 1916 both sides had been hit hard by the earlier attacks, that did not mean that it was over. Brusilov believed that another effort was more than justified and continue to push his troops to launch more attacks. We will discuss 3 separate efforts today. The first will be in the middle of July, then one two weeks later near the end, and then finally one the first week of August. While these were all separate attacks, they were launched very close together with only a few days separating the end of one from the beginning of the next. In the middle of all of that we will talk about the fact that Falkenhayn, and the Germans as a whole, finally got their wish and go command of the entire Eastern Front, right before Falkenhayn himself was replaced as German Chief of Staff. We will of course close out this episode by talking about the offensive as a whole, and its impact on the wider world of the war as well as on all three of the participants. We will end this episode with a bit of a look about Brusilov's legacy in Russia, which would start with this attack but then go through the Revolutions of 1917 and beyond. The Germans had hoped to launch a big counter attack in the middle of July, primarily with Austrian troops in the middle of the line, however they never got their chance, and this was because Brusilov was planning another attack of his own. This attack would not just be launched before the Germans could launch their own by some odd chance, but instead because Brusilov had intelligence of the coming attack and decided to pre-empt it. This would be the first time that Brusilov would be launching an attack with a massive numerical superiority on his front. This had been made possible by the continued funneling of effort by Russian high command into his front. This included the Guards Army, that we discussed last time, which was theoretically the best offensive weapon in the entirety of the Russian Army. Having this advantage caused Brusilov to change his method of attack, partially because he now lacked the men that he had spent so long training during the spring and partially because he believed that he now had the numbers required to simply batter through the enemy line. Unfortunately, this also meant that he was sort of setting up his new attack in the old Russian style, like what we saw at Lake Naroch a few episode ago. He was still going to attack on a pretty wide front, but gone were the extensive preparations and the intricate and coordinated waves of men. This attack would once again be aimed at Kovel, with once again the hope being that he would be able to split the front in two and separate the Germans and Austrians. I want you to prepare yourself, you are going to hear a lot about attacks against and towards Kovel today, to the point where my outline contains the following three headings "The Attack Against Kovel", "The Attack Against Kovel…Again", and "The Attack Against Kovel Again Again" those Russians just would not know when to quit. The artillery bombardment would begin on July 16th in preparation for the attack the next day. The Russians now had drastically more artillery than the Germans and Austrians, some estimates put this advantage at up to 6 to 1, and they had far more men. These two combined meant that when the attack went forward it met with almost instant success. Quickly the Austrian first army began to retreat. The Russians soon ran into difficulties through. They had to cross the Stokhod river on their way forward, this should not have been a huge obstacle for the army since in this area it was shallow and slow but they did not account for the fact that the slowness of the river created large marshes on either side which made any movement almost impossible. In many places men could only advance single file and the guns were pretty much just stuck. Even with these difficulties the attack would continue. On the Austrian side the situation was looking grim. The attack took 12,000 prisoners right at the start, and a Hungarian Landsturm regiment simply panicked and broke right in the middle of the line. As they continued their frantic retreat they pulled the rest of the line with them. This retreat did not stop until they were 8 kilometers to the rear. Linsingen was forced to move German reinforcements into the area to try and stem the tide. He sent in a full division plus three extra regiments and as soon as this was ordered he requested more troops from Falkenhayn, a request that was denied for the moment. During conversations both of the German commanders believed that the Austrians were pretty much worthless at this point, but Falkenhayn stood firm on his refusal to send more troops. It was in this area that the German and Austrian troops began to be mixed together down to the company level as Linsingen tried to find a way to steady the Austrian troops. This would wind up being successful, the Russians tried another large attack in this area around the Stokhod on the 20th of July but it was stopped by the defenders. A big reason for this was apparently the fact that, while the attack went forward in the early morning at about 2 AM, they were illuminated by a full moon. With this attack halted the commander of the Russian 11th Army decided to change the emphasis of his attack to the south of the previous efforts. Here they would hit the Austrian 2nd Army and attempt to capture the city of Brody. It took 3 days for the supplies and men to move to the south to prepare, but when they attacked they once again met with success. This attack was launched at 4PM on July 27th and by 4:30AM the next morning Brody had been taken along with 13,000 prisoners and mountains of ammunition. This unhinged almost the entire 2nd Army front and the entire army was forced back 20 kilometers before they reached an area with defensible positions. In some areas this retreat was not even required, instead the Austrian commanders simply did not trust their troops to hold the line. This caused the Austrians leaders to even go so far as to prepare to evacuate Lemberg, which was another 30 kilometers behind the front. Just to illustrate how extremely cautious they were being, Lemberg, at 30 km behind the front, was further from the fighting than the original fighting lines from back in May. The Russians had taken 2 months to advance this far, but the Austrian generals were afraid they would double that very soon. The lack of faith in the Austrian soldiers was not just a sentiment shared among their commanders, the Russians noticed as well. The official reports of the Russian 11th Army does not even really praise the Russian troops for their success, instead claiming that the Austrian ineptitude was the reason for their success. Here is a quote "The third phase of general operations for the Eleventh Army ended with the taking of Brody. 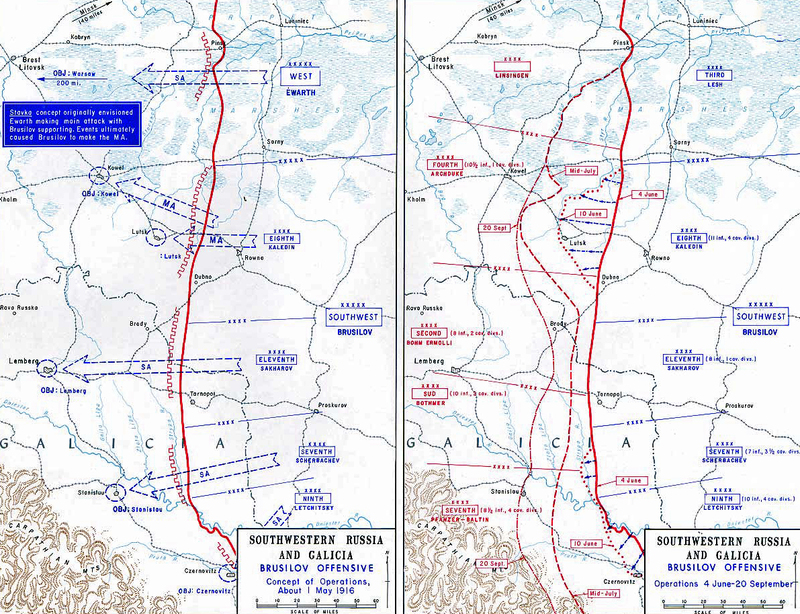 Completing this operation required three bloody days of fighting on both sides. Despite the outstanding work of the artillery and the unceasing forward pressure of the troops, the enemy never provided persistent opposition, which was recognized by many brave, combat proven participants of this battle.." The Austrian army was also beginning to get a considerable amount of pressure from the Austrian politicians back in Vienna. One report from the Foreign Minister accused Conrad of being out of touch and irresponsible, but the harshest criticism always came from the Hungarians. One Hungarian representative would openly blame the Austrian military leadership for the current situation and a whole group of Hungarian political leaders began to advocate for a unified leadership team for the Eastern Front under German control. They were proposing that Hindenburg be given the command of the entire Eastern Front with Archduke Friedrich being given a high ranking position on his staff. This would have included the further mixing fo German and Austro-Hungarian troops, since just the presence of German troops often created better results. Things seemed to be going exactly to German plan as we discussed last episode. With members of the Austro-Hungarian government now actively trying to replace Conrad, Falkenhayn certainly was not going to let the situation slide by without taking action. However, he was very carefully stepping through a minefield because he absolutely did not want Hindenburg getting command of the entire Eastern Front. This was because of the strained relationship that Hindenburg and Falkenhayn had all along, but also because Falkenhayn feared that if Hindenburg was given so much power it would be easy for him to this push to have Falkenhayn replaced. Falkenhayn tried to find another solution to prevent having to give Hindenburg the entire front, but with both the German and Austrian governments against him it was impossible. Therefore, the eventual solution was to give the German High Command overall command of the entire Eastern Front with Hindenburg in command of everything from the Baltic to the Dniester. This helped the front in a few ways. The first was that it simply made the Germans responsible for everything, and gave them much higher stakes in the game. This ended any conversations about not giving the front resources. It also increased the communication and coordination between the armies along the front, letting them be more flexible with their resources and reserves. The agreement also brought with it more German reinforcements from the north, now that they were not being hoarded by Hindenburg and Ludendorff. One final thing that it did was put Hindenburg and Ludendorff in the position to take credit for stopping the Brusilov offensive, even though I am not convinced that they really had much of a part in it. As we discuss the last two major Russian efforts it seems clear to me that by the time the Dynamic Duo took over the front most of the Russian ability to do anything other than push the front back a bit was in the past. The next Russian attack would not take place near Kovel, instead it would once again take place in the South. On the 28th of July the guns would begin firing and they would include a good number of shells filled with gas. When the attackers went forward at 11AM they quickly pushed through the first line, the 7th Army once again took the brunt of the attack and there was a good amount of retreating, but it was nothing like the situation of a week earlier. There were also attacks towards Kovel and this attack would finally utilize the Guards Army. The goal was to push the Austrians finally and completely beyond the Stokhod and then to carry forward the attack from there. To do this the Russians would unleash 250,000 men against just 115,000 defenders. They would still have to deal with the problems of the marshy ground, but this was something that would also effect the defenders. The geography prevented the Austrians and Germans from being able to dig proper defensive positions and this left them generally quite exposed to incoming fire. When the guards went forward they did so in desne masses, with some reports of them moving in formations up to 20 men deep. 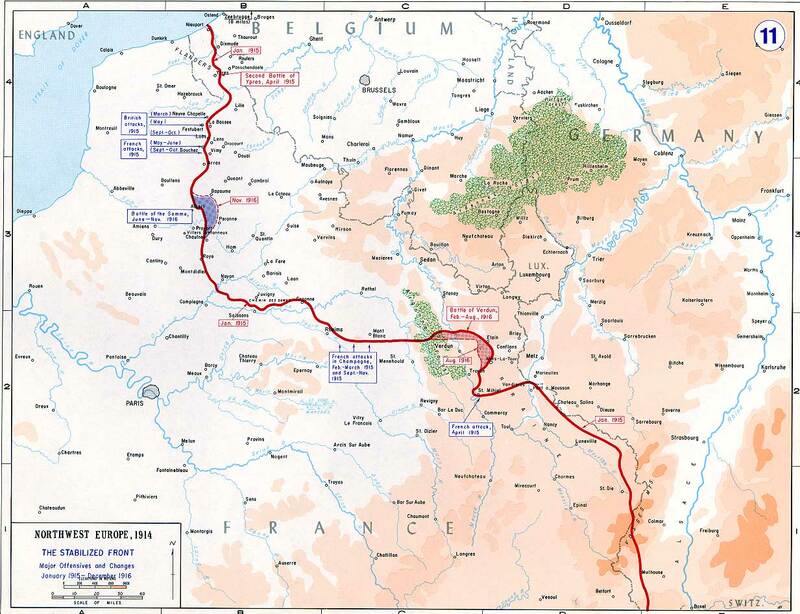 This tactic initially met with some success, with the Germans and Austrians forced to abandon their front lines. However, against these tactics the defenders quickly regained their composure and began to cause huge casualties. Wave after densely packed wave of Russians came forward, and they were mown down by German and Austrian artillery fire. There was still some concern that these tactics would eventually push through, just on the fact of sheer numbers, especially against the primarily Austrian defenders, but this is when the effects of having the Germans in command began to be felt. By the end of July, just a few days after the attack had begun, German troops were being put into the line in the threatened sectors. German regiments were sent to all of the Austrian divisions, and larger German formations were sent to the hardest hit positions. A large number of Austrian commanders were also replaced in front of Kovel and with Germans at almost every command post down to the battalion there was a sense among many of the remaining Austrians that finally the cavalry had arrived and everything was going to be okay. It is somewhat amazing reading some of the Austrian officer's accounts about how much the arrival of Germans in force to a given location changed their outlook on the situation. This transition of troops was assisted by the fact that the Russians did not launch any large efforts during the last days of July. There were numerous smaller scale attacks on localized fronts, but they were generally poorly planned, poorly supported, and poorly executed and just cost the Guards more casualties. The delay in another large effort, and the wasteful efforts of the smaller attacks, allowed all of the defenders to once again catch their breath, adjust to new commanders, and bring in much needed reinforcements. Confidence and resources grew so rapidly in the last few days of July that the Germans started to plan a counter attack. The plan was for the attack to be launched on the third of August, only it would not be utilizing the troops in front of Kovel, instead it would be in the south. This would involve the 7th Army with the goal of pushing the Russians back out of the Carpathians and allowing the Austrians to shorten their lines. When this attack was launched, it did not quite go as planned. The Russians had fortified their positions in a few key locations and it made it very difficult for any headway to be made by the Austrians. So in some areas the Russians were pushed back, but not in the most important. The biggest problem was that while the situation to the north had solidified, and some troops had been sent south for this new effort, there still just was not enough manpower to pull off anything really important, especially when it became clear that the Russians were about to attack again in the north. Brusilov had used the first week of August to regroup his troops and prepare for his next effort. He was now under quite a bit of pressure from Alekseev to produce more results with the resources that he had and to really start capturing things instead of just pushing the front forward. Because of this pressure, and his belief in the fact that the enemy was about to break Brusilov altered his orders to his army commanders once again and instructed them to narrow their front of attack so that they could achieve absolute superiority. This was sort of just another step toward a narrower front which he had begun in his last attack, which had been unsuccessful. With the doubling down on the approach of a narrower front when the Guards Army went forward again it would be on a front just 15 kilometers wide, a far cry from the 30 kilometer or more that were being used in June. On that 15 kilometer front they would have 4 times as many troops as the Austrian and German defenders and this time both the 8th Army and the Guards army would be used in the attack. Right before the attack went forward the Austrian attack in the south that we just discussed was launched. While this did not greatly move the front, it did cause the commander of the Russian 9th Army to start calling for reinforcements, and when this was denied he escalated his concerns all the way up to Alexeyev who ordered Brusilov to send reinforcements south, even if it meant weakening the upcoming attack. Brusilov was also forced to delay the attack due to trying to move those men out of the line. It would not go forward until August the 7th. The troops that Brusilov sent south would be used to launch a counter attack against the Austrian 3rd Army on the north side of the Dniester river. The Austrians, for lack of a better word, disintegrated. Troops retreated so fast that they got mixed up with reserves behind the front and reinforcements trying to move forward, chaos reigned. However, to the north of the 3rd Army the line held just fine. The units to the north would be forced to retreat when night fell, but unlike the troops to their south it was a nice orderly retreat. The next day the fighting continued, but this time there was not any panic, instead just a voluntary withdraw on a wide front. This made the Russians, the tired Russians who had now been fighting and marching for days, continue to move further and further. As the front deepened the southern Russian armies simply ran out of men and energy to continue forward and so the attack stopped. Brusilov would try to jumpstart the situation again by sending another division from his reserve in front of Kovel, but they did not arrive in time and could not outweigh the exhaustion of the rest of the troops. 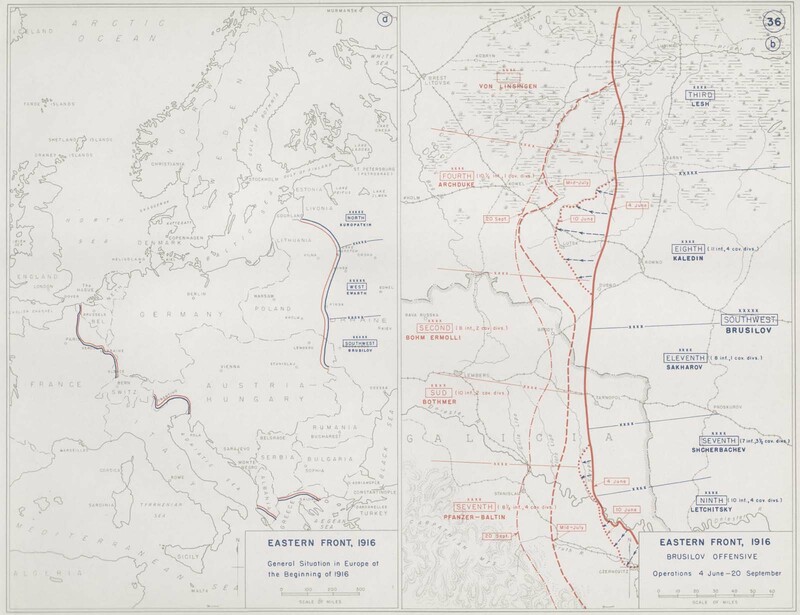 It was actually druing this attack that the deepest penetration of the entire year would occur for the Russians, with some units taking up positions inside of Hungarian territory, not that it really meant much beyond the propaganda victory. More Russian reinforcements could have been sent to the south, a whole lot more if Brusilov wanted to, but those were currently in route to Kovel…again. And it was there that the last large effort of the Brusilov offensive would be focused. Of course it all came down to Kovel, of course, and this effort, other than the narrowing of the front would look a lot like the ones that had come before it. This time when they went forward they found not a disorganized defense but instead one that was ready and waiting for them. Everywhere that the men went forward they were shredded by defensive machine gun and artillery fire. They were not assiste by the swampy terrain that slowed them down and limited where they could move. On the first day the attacks continued for 12 hours with no result other than the fact that 20 percent of what was left of the Guards Army became a casualty. The next day the same thing happened, and Brusilov would have to call a halt to any further attempts. By August the 15th both the northern and southern attacks had died down. The Guards Army had lost more than 54,000 men during its attacks since the middle of July. The attempts to take Kovel did not end in August, but generally everything after this point is not considered part of the Brusilov offensive. Over the next 2 months over 17 attacks would be launched, finally petering out in November. None of these were large, and honestly none of them had a real chance of greatly changing the situation because after the August 8th Attack the German and Austrian troops were just too well prepared and too strong. And so, after two and a half months, the Brusilov Offensive was over. The casualty numbers from the Brusilov offensive were staggering. The Austro-Hungarian army lost around a million men as casualties from June to August, and the Russians lost about half of that number. The worst part for the Austrians was that half of their casualties were prisoners, pointing to a serious problem with morale and the resiliency of their troops, a very worrying trend. These massive surrendered give us some pretty interesting statistics for the battle. For example, during 4 days in June the Austrian 4th Army went from 120,000 down to just 36,000. Of those 84,000 casualties, 76,000 were taken prisoner. That is just a staggering percent. The larger outcome for the defenders was that the Austrian army essentially ceased to exist. The Germans had basically been given the keys to their allies army starting in late July and escalating over the next few months. However, while it showed that the Austrian leadership was seriously deficient, it was probably a good thing for the average Austrian soldier. Their leaders had proven that they were incapable of effectively organizing and commanding a defense against strong pressure. With the Germans in charge, a German artillery behind them, and German machine guns spread along the front, and German leadership teams in charge things were generally much better. The rapid decline in Austrian prestige was a sad end to a once great and storied empire. It had essentially been demoted from a great power to a German client state, a larger Bavaria. Conrad would write around this time that "If the Allies win, we have lost. If Germany wins, we are lost." and in this case his words could not have been more correct. Austria-Hungary, as an independent state, was dead, and it would never rise again. On the Russian side, August 1916 represented a high point, maybe the high point, of the war. It was however dampened in September and October when the Romanians, who had only recently entered the war, were also completely wiped off the map as soon as the Germans began to attack. Even though the Brusilov Offensive was a large scale success it did cause problems for the Russians looking forward. Most of the units south of the Pripet found themselves at about 50 percent strength by September and all told the Russians would need 300,000 more men for their offensive plans in 1917, and oh yeah, that is not 300,000 men total, that is 300,000 men per month, per month, for 6 months or more! Even the seemingly infinite manpower pools of Russia were starting to look a bit too shallow for the task ahead. There was also growing unrest in both the army and at home and that war weariness was about to explode. There were even several Russian units who would mutiny towards the end of 1916. This was kept under control, if barely, by the Russian commanders in the field, and it was hoped that a quiet winter was just what the doctor ordered for the Russian army, and it was hoped that by Spring everything would again be well. When Brusilov would look bck at the war, he was a bit more negative on what his attacks had accomplished saying "[t]hese operations brought no strategic results. [ ... ] The Southwestern Front did everything that it could in line with the possibilities. It was not in a position to do more-I at least could do no more. Perhaps in my place a military genius like Julius Caesar or Napoleon could have realized more, but I had no such ambitions and I could not have had them." He had certainly been successful, but he had not really won anything, maybe if Evert had been more proactive in the north during June, or maybe if the Austrians had been more successful in Italy, making it more difficult to pull troops back, maybe something better would have resulted, but it did not. Even though he would not claim a great victory, Brusilov had already taken his place in Russian history. Western historians often call the Brusilov Offensive the greatest Russian achievement of the war. However, Brusilov's role in pushing the Russian Army to the brink of breaking cannot be ignored. Brusilov would be put in command of the army for awhile in 1917, but even with his great name, the damage was done and the army would end up playing a leading role in the revolutions of 1917. The Soviet military would rise from the ashes of revolution in 1918 and they would also regard Brusilov as the greatest Russian commander of the war. They would credit him as the founder of modern combined arms doctrine because of his work trying to weld the infantry, artillery, and aircraft into one cohesive unit. Many of his staff would go on to play leading roles in the Red Army. Nothing can take away the fact that Brusilov presided over the height of Russian wartime achievement. He had done what few of his contemporaries thought was even possible, he had launched a large Russian offensive that was not a complete failure. And Even if the offensive moved the Russian nation towards what came after, the mutinies, the revolutions, the civil war, those probably would have happened anyway.